The second game in three days and the second haul of maximum Premier League points. Now just four points behind West Brom in 8th place and with those two games in hand. There is now a three point gap to 10th place Watford, who have played one game more. It didn't look too promising before the match, as Oriol Romeu sat out the first of his two match suspension and Steven Davis sustained GBH from Delaney in the Crystal Palace on Wednesday. Replacing these two key players were Jordie Clasie and Pierre-Emile Højbjerg, both players who have yet to show their true potential for Saints. The other thing of note was that Chris Kavanagh was refereeing his first ever Premier League match. So, he would not have been nobbled by any of the 'big' clubs yet. From the kick off Saints settled into their usual attractive approach work, without any real product. Tadić, Redmond and the returning Bertrand caught the eye straight away. Unfortunately so did Long, because he was having little effect at the front. Again, he was doing all the right things, except looking as if he would put the ball in the net. At the other end Rondón had been comfortably shepherded by the impressive Yoshida. Maya has looked better and better as his run in the first team has extended. In fact the Japanese CB has now struck up a decent partnership with Jack Stephens at the heart of Saints defence. What were we worrying about when van Dijk was injured and Fonte had departed for West Ham? Our other personnel worry recently has been the goalkeeper, but in the 20th minute Fraser Forster had to make a fairly decent save, diving to the lower left of the goal to palm away a drive from Morrison. It was not to be the first time the big man was to impress in this game. 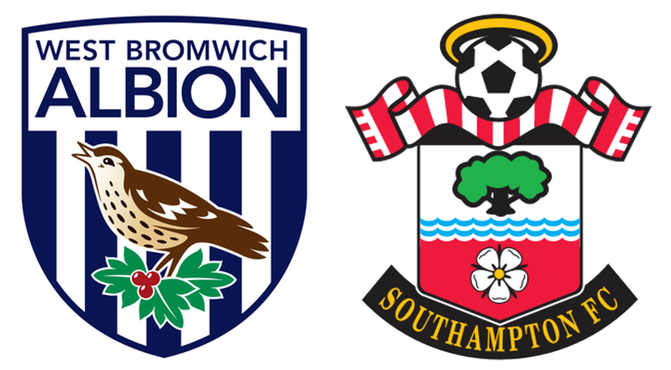 Saints defence were already working hard and had to be at their best, as West Brom won two corners in as many minutes, but they came to nothing. Then, on 25 minutes the West Brom defence was breached. Once again the architect was Tadić, who receiving the ball from Long, laid the ball square to Clasie, who fair lashed the ball into the net past the static Ben Forster. It caught me by surprise when it was pointed out that it was the little Dutchman's first league goal for Saints. It was a great goal and signalled a posse of journalists writing the words 'Classy' and 'Clasie' into their copy. Up until the goal, the match had threatened to descend into one of those end of season games in the sunshine, where neither side has anything to play for. However, now Saints had the lead they did have something to play for and continued to attack. Redmond was then tripped by Nyom heading towards the goal like an express train, but Tadić drove the resulting free kick straight at the defending wall. Shane Long was put through by yet another wonderful pass from Tadić and he seemed to have been unceremoniously brought down right on the edge of the penalty area, but the referee waved Long away, to the sound of a hail of abuse from the home crowd. As an ex-West Brom player, he got a lot of stick from the home crowd throughout the game. In the second half, Long continued to be heavily involved in the play and Ben Forster came out of his area to head clear from the Irishman, after almost being put clean through by Tadić. There was then a break in the play, after Long and Dawson had clashed heads. Long needed a fair bit of treatment, which resulted in the West Brom fans getting up a fair head of steam, as they continued to boo him. There was an increasing amount of activity in and around the Saints penalty area and as the game entered it's last third, there were loud appeals for a penalty after Forster had dived at the feet of Rondón. In spite of the noise, the referee was not impressed. It was not all West Brom, as Redmond had a couple of half chances. The first was fired straight at Ben Forster and the keeper clutched it gratefully to his chest. The second was a volley from a Cédric cross, which Foster tipped away from his near post. Moving swiftly back up to the other end, Chadli could only shoot tamely at Forster, who looked untroubled. The crowd than cranked up the noise as their team searched for the equaliser. Saints defence was up to the job though, with Yoshida and Stephens like rocks in the centre and Forster throwing himself at the ball every time it came anywhere near him. Foster made a blinding save from Dawson's volley deep into injury time, but the rebound fell to Morrison and he could only blaze the ball over the crossbar. That was virtually the last kick of the game and Saints managed to close the game out without any further drama. An excellent result all round and one that the defence in particular could look back on with not a little pride. There were two clear contenders; Maya Yoshida, who was absolutely faultless in the heart of the defence and the rock on which so many of West Brom's attacks foundered. The other being Fraser Forster, who after being vilified by Saints fans for so long, turned in a masterclass of goalkeeping. I am giving it to Maya Yoshida, as he is just maturing like a fine wine and the regular clangers he used to make on a regular basis are just a dim and distant memory.